In high school, Realmuto was a three-sport standout at Albert High School in Midwest City, Oklahoma. He was a standout quarterback for the football team, leading them to a 5-A state championship in 2009, his senior year. He set national high school records with 88 hits and a 118 RBI, while hitting .595 with 28 home runs in 42 games. J.T. is a team leader. His makeup is off the charts. In 2012, the Baseball America Prospect Handbook rated Realmuto as the 5th best prospect in the Marlins' organization. They had him at #9 in both the spring of 2013 and 2014. Then they moved J.T. up to second best in the Florida farm system in the offseason before 2015 camps opened. 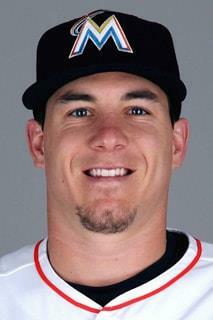 In 2014, Realmuto was named the Marlins minor league Player of the Year. J.T. was called up to the Major Leagues for the first time on June 1, 2014. Don't be deceived by the position he plays. With his athleticism, Marlins catcher J.T. Realmuto is helping to redefine what it means to be a catcher. The 25-year-old has speed and quickness, and early in the 2016 season, he became the first catcher in Marlins franchise history to bat in the leadoff spot. In Spring Training, Realmuto's teammates also discovered he is a ringer on a Ping Pong table. "J.T. is quiet," Miami infielder Miguel Rojas said. "He never talks about things like [playing ping pong]. He's got so much athleticism. He can do whatever. I've been surprised [recently] with the way he has been blocking balls [as a catcher]. That's how surprised I was when I watched him play Ping Pong in Spring Training." "I like to play a lot, it's something that relaxes me," he said. "Also it's good for hand-eye coordination." At Carl Albert High School in Midwest City, Okla., Realmuto was a star quarterback and a standout shortstop. But, the 6-foot-1, 210-pounder turned down an opportunity to play quarterback at Oklahoma State, as he opted for baseball after the Marlins selected him in the third round in 2010. Realmuto's Ping Pong skills were developed at an early age. "My dad played a lot when he grew up, and he kind of introduced it to me," Realmuto said. "My high school teammates, we started playing every day, and it took off from there." Not only did Realmuto have a table in his home, so did a number of his friends. "When we left the baseball field or football practice, whatever it was, we'd go to one of our houses, jump in the pool to cool off, and play Ping Pong for hours," the 25-year-old said. "It was pretty much nonstop." Upon being hired by the Marlins during the offseason, manager Don Mattingly set up a leadership committee among the players to help create a better line of communication with the coaching staff and the organization. If the players wanted something, within reason and as long as it didn't adversely impact the business of baseball, Mattingly was open to it. In Spring Training, the players got approval to bring a Ping Pong table into their clubhouse at the Roger Dean Stadium complex in Jupiter, Florida. "I got real excited," Realmuto said. "It was awesome. It takes your mind off [the grind], and you just relax with your teammates and friends." The new table helped keep things loose in Spring Training. It also was a chance to see which players on the team could play. Rojas used to play competitively growing in Venezuela. Third baseman Martin Prado, also from Venezuela, can hold his own, as can lefthander Justin Nicolino. "He had his own $200 paddle; it was kind of cheating," Realmuto said. "He'd hit the ball, and knuckleballs would come off that thing. I made him stop using it. It wasn't fair." "In every other clubhouse, I used to be the best, because I used to play ping pong when I was little," Rojas said. "But I found really good competition in this one. J.T. is really good. He used to be a shortstop, so he being good didn't surprise me. Martin is really good, too. It was really fun in Spring Training. There was really good competition." At some point, Realmuto hopes the Marlins can add a table somewhere in their clubhouse at Marlins Park. But during the regular season, things are run more strictly than in Spring Training. So, for now, off the field, the Miami catcher plays whenever he can. But in the Minor Leagues, there was at least one ballpark where Realmuto regularly played ping pong before taking the baseball diamond. 2016: J.T. Realmuto had an excellent season, following up a pretty good rookie year in 2015. His defense got a little better and his offense improved significantly. Realmuto finished 2016 with a .303/.343/.428 line, including 11 home runs, 48 RBIs, and 12 stolen bases. In terms of fWAR, he finished third with 3.5, behind household names Jonathan Lucroy (4.5) and Buster Posey (4.0). Of the top eight catchers ranked by fWAR, only Realmuto (1.2) and Steven Vogt (0.8) were positive contributors while running the bases. For the old-fashioned baseball fan, Realmuto finished third among qualifying catchers in batting average — his .303 was only slightly behind co-leaders Wilson Ramos and Yadier Molina at .307. Realmuto did this well despite a tumultuous season in which he hit in every possible spot in the batting order. J.T. had a .343 on-base percentage in 2016, 7th best for any catcher in MLB. And his 12 stolen bases were 1st among all catchers (who played 50% of games as a catcher). As much as Realmuto is an athletic freak, in the context of his family he’s practically normal. His father, David, and sisters, Ryan and Amanda, played collegiate baseball/softball. And his mother, Margaret, is the oldest of 10 siblings in the Smith family that — along with in-laws and, now, a very decorated next generation — is royalty in the world of American amateur wrestling. John Smith, Oklahoma State’s wrestling coach and a six-time world champ (including two-time Olympic gold medalist), is one of Realmuto’s uncles. And Smith is convinced Realmuto could have been as accomplished as his cousins had he not given up wrestling as he entered his teenage years. Smith’s favorite memories of Realmuto the youth wrestler are from holiday get-togethers. The family would gather around the living room and pit the cousins — Realmuto has about three dozen of them on his mom’s side — against each other in tournaments. Realmuto held his own against those closest to him in age, including future NCAA champions Mark Perry Jr. and Chris Perry. In there somewhere, perhaps, is another future major leaguer or NCAA titlist. Realmuto said his childhood wrestling helped groom him as the well-rounded athlete he is today. Now, that foundation allows him to play a little first base on the side, plus be one of the best young catchers in baseball. May 12, 2017: As a multi-sport athlete growing up in Del City and eventually Midwest City, Okla., Marlins catcher J.T. Realmuto was continually on the go. Whether or not he was playing baseball, his mother, Margaret, was by his side. "My dad always coached my older sisters in softball, and I was the youngest," Realmuto said. "So my mom always got stuck with me, dragging me to the ballpark in Little League. Going to basketball games, football, she was the one always taking care of me." Now that Realmuto is one of the top catchers in the Majors, Margaret watches all of his games on television at home in Oklahoma. Realmuto's mother and father, David, were on hand for their son's big league debut on June 5, 2014, at Tampa Bay. That day, they saw Realmuto go 2-for-4 with three RBIs. June 28, 2017: Realmuto has a reputation as one of baseball's most athletic catchers, and perhaps that's because he hasn't always been a catcher. When Realmuto was drafted by the Marlins in 2010, he was listed as a shortstop, where he'd played on a state championship team in high school. He also had opportunities to play quarterback at Division I football factories; instead, he chose baseball, and now he's developed into one of the better young starting backstops in the Majors. It's one thing to say that Realmuto looks athletic, of course, and another thing to actually quantify it. But as we continue to progress with using Statcast™ metrics to help improve our understanding of catchers, we're continually learning one thing: Realmuto constantly stands out. Take foot speed, for example. Our latest public metric is called "Sprint Speed," and it measures how many feet per second a player covers in his fastest one-second window. The slowest runners average about 23 ft/sec and the fastest hit 30 ft/sec, making the Major League average 27 ft/sec. Realmuto, at 28.7 ft/sec, easily tops every other catcher. He tops shortstops like Corey Seager and Zack Cozart. He tops center fielders like Jon Jay and Joc Pederson. J.T. Realmuto is baseball's fastest catcher, and it's not even close at all. Realmuto recently talked to MLB.com about how his multi-sport background helped him. "I've always been fast, from playing football, basketball," said the Miami catcher. "It didn't matter, whatever sport I was playing, I was always running. I tried to do my best to keep my athleticism with where it's at. "Even when I wrestled back in the day, my footwork, I feel like all that has contributed to my speed. I have other athletes in my family who were fast too. It has a lot to do with genetics, but I think, growing up in those sports, and being around it all the time, it's helped." As Martin Prado bats in the 6th, J.T. Realmuto steals second and quickly follows that up by stealing third. Since 2015, Realmuto's 23 stolen bases are the most of any catcher, and that's a decent proxy for foot speed, but we've always known we can do better than that. Steals are based in part on opportunity, reactions, and the willingness of management to give the green light. What we're interested in here is the actual skill of speed, and Realmuto isn't merely baseball's fastest catcher. Other than Dee Gordon, there's no other regular Marlin faster than Realmuto, who is essentially tied with outfielder Christian Yelich (28.6 ft/sec). Realmuto is so fast, in fact, that it actually takes opponents by surprise when he beats out hits. "I get it from infielders all the time," he said. "If I beat out a ground ball at the shortstop, every now and then, playing a new team, they'll take their time in throwing me out. They'll either just get me or sometimes I'll beat it. I'd catch them by surprise. The next time, they'd come into the box, they're like, 'Man, you are fast for a catcher. I didn't know you were that fast.' So it's still catching guys by surprise, guys I haven't played before." Realmuto's RBI infield single J.T. Realmuto hits an infield single to third base, allowing Marcell Ozuna to score to give the Marlins a 5-4 lead in the 8thRealmuto's athleticism manifests itself in other ways, too. While he's never been a strong framer, he's got truly elite pop time — that is, he gets the ball out of his glove and to the infielder faster than just about any other catcher. Last year, of 57 catchers who had at least 10 steal attempts of second against them, Realmuto's average pop time of 1.89 seconds was the best in baseball, where the MLB average was 2.02 seconds. This year, his 1.91 second time is second only to San Diego's Austin Hedges, at 1.88 seconds. When he nailed Philadelphia's Odubel Herrera trying to steal on April 27, he did so with a 1.38 second pop time that was the fastest ever tracked by Statcast™ on a steal attempt of second or third. "Obviously, with catching, I'm going to slow down over time," said Realmuto. "I'm going to be less and less athletic the longer I catch. But my offseason is geared towards trying to stay as athletic as I can. In the weight room, I'm not trying to put on too much weight. I'm not trying to get too bulky. I'm trying to keep as athletic-fit as I can." July 2018: Realmuto was selected to play reserve in the MLB All-Star game. July 9-July 12, 2018: JT was on the paternity list. His first child, Gracie Laine Realmuto was born on July 10. Nov. 2018: Realmuto was on the MLB roster for the 2018 Japan All-Star Series with Nippon Professional Baseball (NPB). 2018: Realmuto had the highest current WAR (13.1) of any Marlins player. June 2010: The Marlins drafted J.T. in the third round, out of Albert High School in Midwest City, Oklahoma. Scout Steve Taylor signed him for a bonus of $600,000. It was a tough decision, turning down a baseball scholarship to Oklahoma State. Feb 2, 2018: The Marlins won their arbitration case against J.T. who will earn $2.9 million in 2018. Jan 11, 2019: J. T. and the Marlins avoided arbitration, signing a one-year agreement for $5.9 million. Feb. 7, 2019: Philly made a big splash by acquiring Marlins catcher J.T. Realmuto in exchange for top prospect Sixto Sanchez, catcher Jorge Alfaro, pitching prospect Will Stewart and $250,000 international slot money. Realmuto has an unorthodox batting style, going into a very deep crouch and holding the bat parallel to the ground. After signing J.T., the Marlins got him to start earlier and calm the loading of his hands. But he still falls into the habit of opening up too soon and pulling off the ball. When he’s going well, he’ll use a more athletic, line-drive swing and stay up the middle. J.T. does his best hitting when he focuses on a shorter swing and all-fields approach. His bat stays in the zone longer. J.T. should hit for a fair batting average and hit some home runs, perhaps 10-15 per season. He consistently makes hard contact. And he hits to all fields. Realmuto does not get beat on really good fastballs. J.T. gets in trouble at times expanding his strike zone. 2014 Season: Realmuto improved every area of his game in his repeat season at Jacksonville, earning two callups to the Marlins and positioning himself as the their catcher of the future. J.T. toned down his swing and aggressiveness to flourish at the plate, making more contact, drawing more walks and hitting for more power than he did in 2013. He projects to have an average hit tool, and he can drive early-count mistakes for power, translating into perhaps fringe power. September 8, 2015: Realmuto became the first catcher to hit an inside-the-park home run and a standard home run in the same game since Gary Carter back in 1980. In 2016, Realmuto was the only catcher in baseball with double-digit home runs (11) and steals (12). And he did it while improving his average from .259 in 2015 to .303 in 2016. In 2018, Realmuto won his first Silver Slugger Award. As of the start of the 2019 season, J.T. 's career Major League stats were: .280 batting average, 59 home runs with 243 RBI in 1,988 at-bats. J.T. has quick feet, good agility and soft hands to receive the ball. He is an above-average defender back there. Realmuto was primarily a shortstop in high school, but the Marlins happened to scout one game were he was filling in at catcher and liked his raw potential. Some parts of the job came naturally to Realmuto, who has a strong arm and quick feet. "Blocking [pitches in the dirt] was the hardest," he said in 2014. "I'm still working hard on that." J.T. neutralizes the running game with an arm bordering on double-plus. His arm is rated a 70 on the 20-80 scouting scale. He has pop times of 1.85 pretty consistently, some even lower than 1.8 seconds. That is a very good arm! In 2011, J.T. was second in the South Atlantic League after throwing out 42 percent of base-stealers. In 2012, he threw out 36 percent of Florida State League base-stealers. In 2014, he gunned down 39 percent of base-stealers with consistent pop times of 1.85 seconds on throws to second base. In 2015, Realmuto threw out 27 percent of attempting base-thieves in the Majors. And he was one of only eight catchers (and the only rookie) with more than 1,000 innings at the position. In 2016, J.T. nailed 35% of runners — 28 of 79 who tried to steal. In 2017, Realmuto gunned down 32%, 25 of 78 base-thieves. In 2012, Florida State League managers rated Realmuto as the best defensive catcher in the league. He is an intelligent player who has always been a winner. He exhibits leadership ability. Realmuto needs to improve at blocking balls and handling tough pitches. He receives well but tends to pick at balls he should body up and block. J.T. also needs to improve at framing pitches. A former high school quarterback, he also has the leadership qualities you like behind the plate. J.T. handles pitchers well and calls a very good game. He has a plan for every hitter that comes to the plate. Handling pitchers remains Realmuto's priority. "A catcher and a pitcher have to have a special bond," he said. "If I'm fortunate enough to catch them in the Majors, I want to make sure they have confidence in me." Marlins manager Mike Redmond was impressed with Realmuto's pitch-calling. March 18, 2016: About the only area of J.T. 's game that needs more development is framing pitches. According to Baseball Prospectus, Realmuto's receiving cost the club 15 runs in 2015. "Last year, I know the metrics on him on his framing and stuff were down," Mattingly said. "I think that's something we probably put more time on this spring and made sure he sees video and things like that, and make sure he knows what that's all about." Realmuto spent much of his offseason and the first month of Spring Training working on it. "I'm getting there," Realmuto said. "We still have two more weeks to work, obviously. I already feel 10 times better right now than I did at the end of last year. I've kind of gotten rid of some of the bad habits I've created, which I think are going to help me a lot with my receiving." The changes behind the plate are subtle, and the adjustments are coming naturally. By his own admission, Realmuto did some things that created "bad habits" in his positioning. To correct himself, he's getting in the proper pre-pitch position and staying there. J.T. is faster than most catchers. In 2015, he stole 8 bases for the Marlins. And he followed that up with 12 more in 2016. But he is a little slow out of the box due to a big follow-through on his swing. June 1-18, 2011: Realmuto was on the D.L. with a laceration to his left hand. March 27-April 17, 2018: J.T. was placed on the DL with a bruised lower back.